HGSounds has released Singularity, a free single Layer from Destiny, the Multi-Layer/Multi-Timbral Synth, for the full version of Kontakt 5.7+. 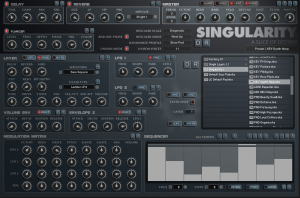 Singularity is a single oscillator Synthesizer which uses Raw Waveforms as the Oscillator. It has 2 Envelopes, 2 tempo clocked LFOs and a Sequencer which are all assigned through an extensive Modulation Matrix. Although Singularity is a single layer of Destiny, it still uses the 11 Layers as a Unison mode and so it can be used for Supersaw type sounds. All Presets can also be loaded into Destiny and vice versa. 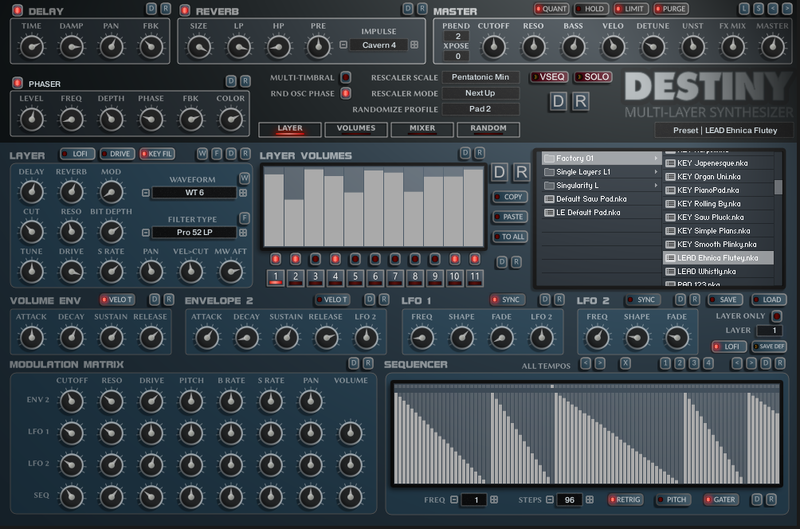 There is also a version of Singularity that is included with Destiny, the only difference is that Singularity Lite uses a reduced number of Waveforms. Best of all, it's free. Price: Free. At the moment Destiny is part of the Augment Group Buy and will be unlocked at Level 6 when enough people take part. The Group Buy is $14.99 to take part. 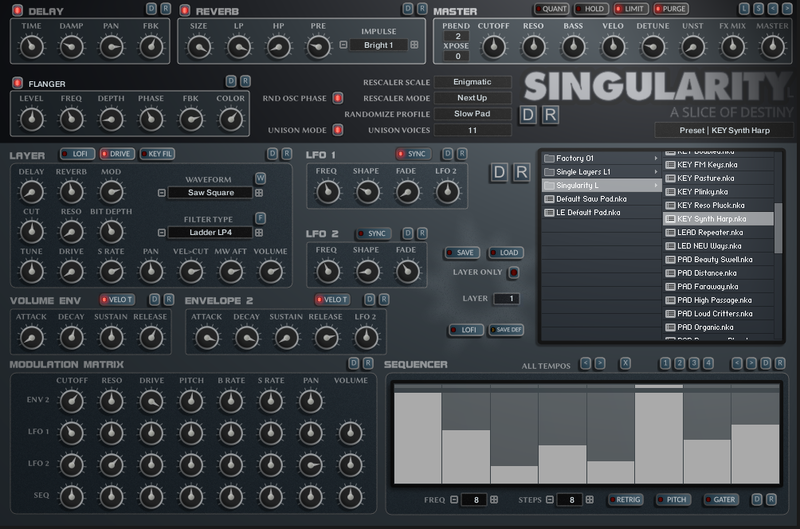 Destiny features 11 Layers each of which contains a Singularity Synth which is also included as a 2nd Synth. The Layers can either be stacked into a Multi Layer Synth or used as a Multi-Timbral Sound Module. Each Synth has 2 Envelopes, 2 LFOs, a Sequencer which are assigned to Destinations via a Modulation Matrix. There are a set of Octave Triggers which use a selectable MIDI octave to trigger alternative layer Volume Levels in real-time. There is also a Sequencer which can be used to Sequence the triggers instead which can create some interesting Sequences. A Destiny Preset contains a massive 884 parameters, and whilst the Layer view gives full control over a single Synth layer, it is also useful to have a way to see all similar parameters for all layers. This allows adjusting them against each, and so Destiny has the Mixer panel. From this Panel almost all Synth controls can be edited easily via 5 Sub Panels as well as the Waveform, Filter type and other Layer options always being visible. If you have other Instruments created by Homegrown Sounds, you will know that there is always an emphasis on tuned Randomizers. Destiny takes the concept further by using a Randomize Profiler which allows Designing complex Randomization Profiles to used by the all Randomizer Buttons. There are also defined presets for those that prefer not to tinker. 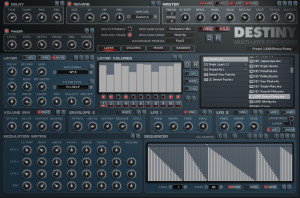 In terms of sound, Destiny and Singularity use basic sampled waveforms which create virtual oscillators. These come from a range of sources including the Analog Four and Evolver plus there are a collection of FM and Wavetable waveforms. In every sense they are like the oscillators of any subtractive synth, so all presets are created using the interface in an identical manner to any VST Synthesizer. The Cassetto Waveforms are also included for the lush analog and slightly broken atmosphere they provide. All are multi sampled to reduce aliasing. The Destiny product page is here, however it could be available as a free bonus product from the Augment Group Buy.